Elves and Giants – a super weekend! What a weekend – not only did the weatherman get it all wrong and we had beautiful skies and 35 degrees – but Plan A turned into Plan B and Plan C and Plan D before it was all over. Originally the plan was for Mon and me to go to Moncton Friday night with Lorna and Peter to see The Divorces play at Plan B on St. George Blvd. at 10:00. Well they didn’t start until 1:15 which meant we had alot of time to kill before. 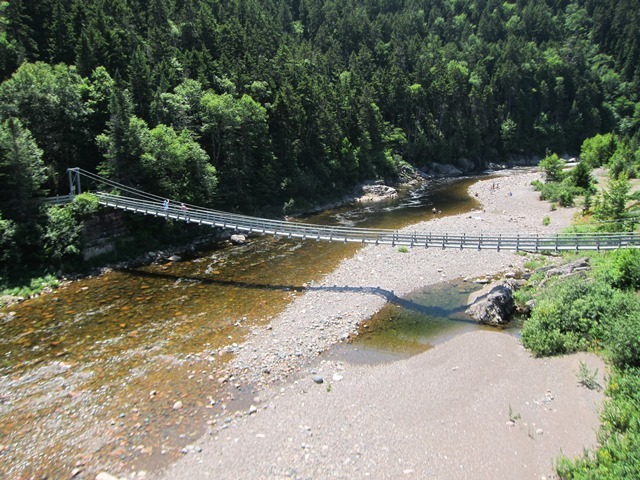 That worked out well because just before leaving Saint John, my cousin whom I had not seen for over 30 years, called to say he was in Petitcodiac and would love to see me. At that very same moment Lorna and Peter called with a crisis – power outage at the cottage! No shower, no hair dryer, no internet connection. CRISIS! So, they would go on to Sussex ahead of us to rent a room and get ready for the evening. Which meant I had time to go to Petitcodiac to see my cousin, Perry Norris from Ontario (visiting at my Aunt Vesta’s house). I traveled 30 years back in time. Perry and I are only 4 months apart so we spent alot of time together as kids. It was great to see him. Bonus, cousin Sharon came over to Aunt Vesta’s also and that provided the perfect opportunity for a photo. She’s like an elf next to me. 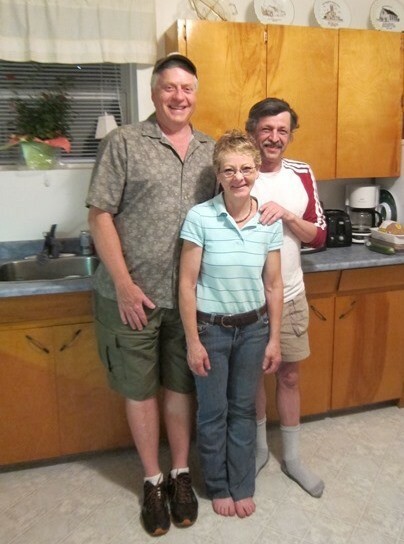 Our parents are siblings Delbert, Royce and Joyce. Uncle Royce was tall so maybe that’s where I got the gene. 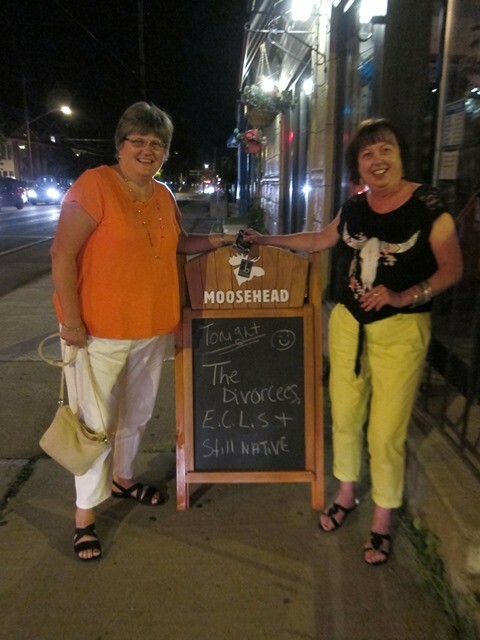 Then, on to Moncton to see The Divorces. They are very good musicians. Country Music. ‘Nuf said. Lorna really enjoyed them – she is a groupie 🙂 and we enjoyed watching her in her glory. We got home to Saint John at 4:15 a.m. Slept until 10:00 the next morning. I haven’t done that for 30 years either. Saturday was a lovely day at Haynes Lake for SeaFood Festival (oh, we eat so well at Haynes Lake!!!) 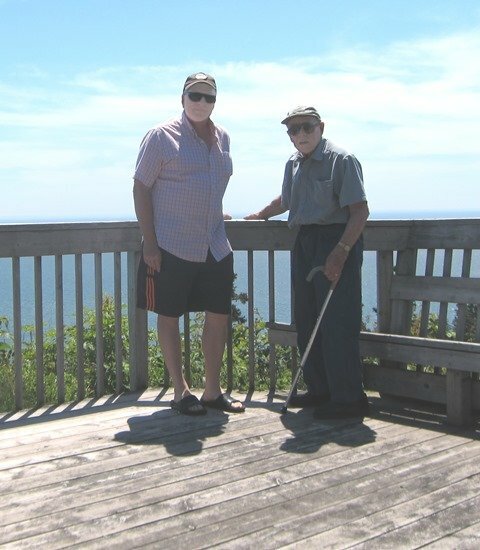 and then Sunday I was off to Havelock to visit Dad for the day. 35 degrees in Havelock, not a cloud in the sky, air conditioning in Dad’s house still broken, Toyota Camry saves the day. 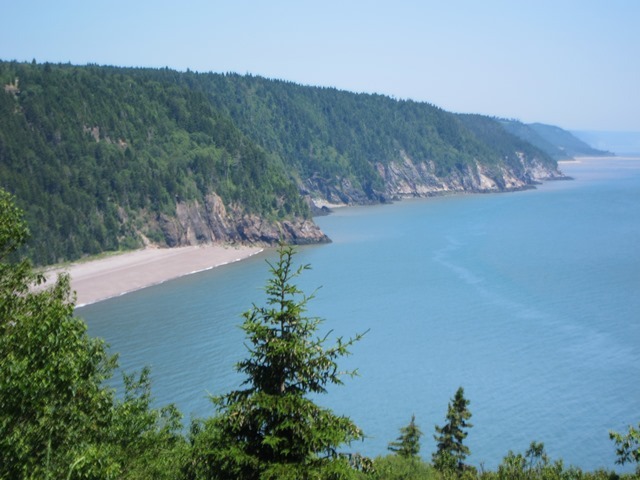 Road Trip to St. Martins to see the Fundy Trail. Beautiful drive. Scenic views, fish burgers and onion rings, and Dad for company. A perfect day. Topped off when I got home and Monica had Cobb salad ready for supper. Life is good and I am thankful.